Researchers at the University of Leicester are attempting to halt the decline of a caterpillar that produces one of the finest silks in the world. 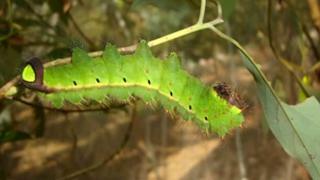 Muga caterpillars, which produce a highly valuable silk, are dying from bacterial infections, in Assam, India. The university believes it has developed viruses that could protect the silkworms from disease and as a result could save Muga silk industry. Muga silk is produced, only in Assam, as the silkworms form their cocoons. The caterpillars have been in decline over the last few years because they are eating infected leaves. Dr Mahananda Chutia, a visiting academic who is employed by the Indian government, said: "As well as its silk trade, Assam is known for its tea and farmers often spray pesticides to protect the tea leaves - these sprays are thought to have reached the silkworms and have weakened them. "In our model system at Leicester, we have found that the consumption of phages [viruses] by caterpillars is a very effective method of preventing bacterial diseases." Dr Chutia has tested his research on common white wax worms, as Muga caterpillars cannot survive in the UK. He returns to Assam at the end of the month to test the viruses by spraying them on to the leaves the caterpillars eat. The university claims if the research works on Muga caterpillars, thousands of farmers in India would benefit.